The AOC CQ32G1 offers a massive, curved QHD screen that is designed to immerse gamers while providing an experience that is on par with E-Sports standards. 32 inches is more suited for 4K displays, but options with the same speed are still nowhere to be seen. If you are after an engrossingly large screen with the promise of smoothness and reduced blurring, the AOC CQ32G1 could be your best bet. The AOC CQ32G1 is perfectly identical to the AOC C32G1 in almost every aspect, but most especially its looks and proportions. This variant, however, is slightly heavier by a half a pound, although the real difference is the beauty of a higher resolution screen. This device is also bezel-free, but there still is a thicker bottom strip and panel borders on the other sides. Build quality is as always excellent just like most offerings from the brand, whether if it’s their gaming displays or their prosumer variants. The AOC CQ32G1’s plastic panels feel indestructible and there are no manufacturing defects such as uneven seams or burrs on the edges. The whole package feels light compared to other similar-sized offerings, but it does not feel cheap in any way. The rear cover of the AOC CQ32G1 also has the x-patterned shape that apexes at a flat rectangle found on its siblings. The bulge is forgivable and even if curved monitors don’t look good wall-mounted, but it is easily doable for this model. As long as your adapter has a 100 x 100 bolt pattern, it will be compatible. It’s great that you can swap out the stand at the push of a button since you might want to spend the extra for one. The AOC CQ32G1’s stand can only offer tilt, unlike the full HD model which allows the display to swivel by a few degrees. The monitor is large so it should fit most sizes, but kids might struggle with a tall display like this variant. For some, curved monitors are considered a waste unless it’s a massive ultrawide which enhances the immersive properties substantially. But that’s not the case with the AOC CQ32G1 since it is large enough to envelop your visual sense when sitting at nearfield distance. This model is also great for couch gaming due to its size which offers what older LCD TV models can offer. You will be able to accommodate almost every host device aside from a PC on the AOC CQ32G1’s feature-rich connectivity panel. The layout includes DisplayPort 1.2 and an HDMI 1.4 and HDMI 2.0 slot for consoles and video players. There is a VGA port for older devices, but there are no USB slots for peripherals and built-in-speakers. 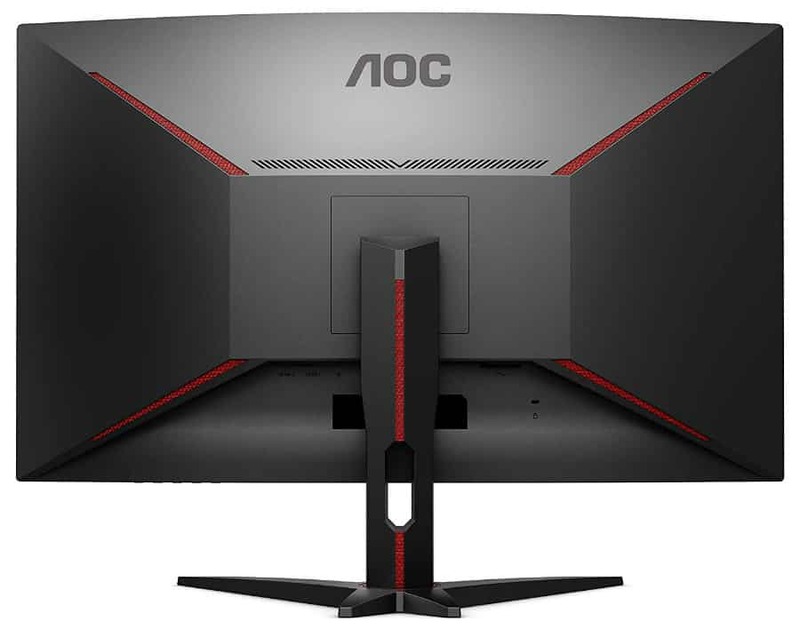 The AOC CQ32G1 boasts a 32-inch curved VA panel with a 2560 x 1440 resolution, 144Hz refresh rate, and 4ms response time. This model is also capable of 1ms MPRT along with a 250 cd/m2 backlight and a 3000:1 contrast ratio. The 1700r curve of the screen is slightly less aggressive than other variants, but it still is noticeably tighter than most ultrawides we’ve tested. One thing that’s immediately noticeable on the AOC CQ32G1 is its lower pixel density which is a result of stretching the resolution to a wider diagonal. The screen feels close to a 1080p 24-inch model, but the details brought about by more pixels still stand out. We still feel that 4K is better suited for this size, but that cannot be necessarily counted as a fault of monitors like this variant. The AOC CQ32G1 posts decent imaging results for a VA panel, there are others with a slight advantage in vibrancy. The display is able to reproduce 99% of the sRGB color space with a decent DeltaE 2.0, but there are noticeable deviances in some secondary colors such as yellows. The screen’s extra warmth is to blame. Tweaking down the reds of the color temp adjuster in the OSD helps a bit, but a colorimeter is necessary if you want to push it further. But on the other hand, the contrast from the AOC CQ32G1 is excellent at 2550:1, ensuring blacks inky and colors are rich and well-defined. This model is excellent for dark-themed games like Rise of the Tomb Raider due to its ability to project shadows and low light conditions with great gradients and range. Gamma is slightly off at 2.3, but that’s almost unnoticeable for most users when VA tech is concerned. The AOC CQ32G1’s backlight is able to reach 248 cd/m2 which is reasonable for daily use but a bit too dim for well-lit rooms. Setting the illumination setting to around 40% is good as an all-around setting, but you need to punch it higher if your room has excellent natural lighting during the day. The biggest limitation with a backlight like this is it will render the 1ms MPRT feature useless because it dims the screen further. But thankfully, most will not feel the need for the 1ms MPRT feature on the AOC CQ32G1 due to its significantly better motion handling. The screen still has a few blurs and smudges in fast-paced action, but we think trading off the backlight’s intensity to correct it is unnecessary. Some titles with extremely quick mouse swipes like CSGO might need it, but for the most part, users won’t need to employ it. Panel uniformity for the AOC CQ32G1 is also within acceptable limits despite the slight dimness of the lower quadrants. The latter doesn’t affect color uniformity on a readily visible scale, but turning on the screen with no input or viewing an all-black image will reveal the difference. This performance is good overall, but it will vary between unit to unit. 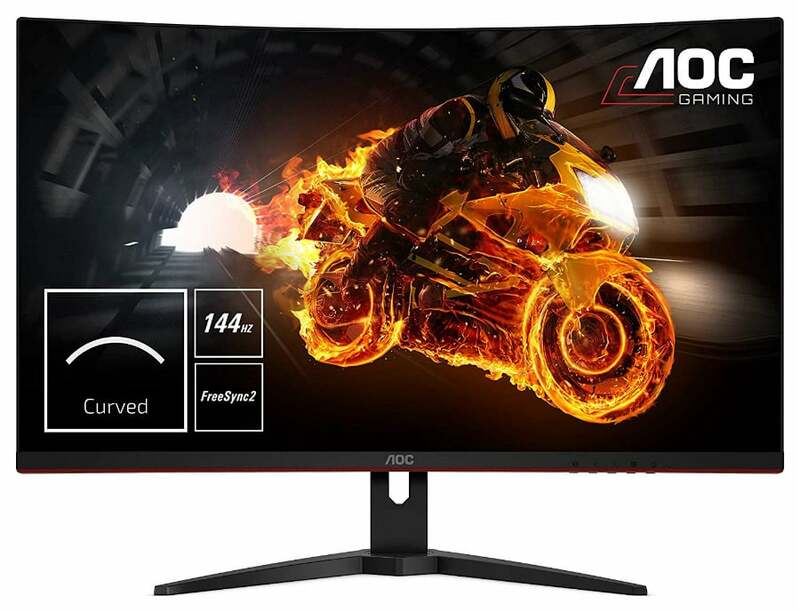 The AOC CQ32G1 is a FreeSync monitor with a 48Hz to 144Hz functional range which isn’t the most comprehensive, but still functional implementation. This model isn’t certified to be G-Sync compatible, but it’s reported to work with Nvidia GPUs if all conditions are met. Input lag is excellent at 11.5ms in low input lag mode, so most gamers will not notice any difference or delays. The AOC CQ32G1 is a well-rounded gaming monitor with an upscaled screen with fantastic immersive capabilities due to its curve and size. The imaging and gaming scores aren’t perfect, but we can consider this model well worth its very reasonable price tag. It’s also surprising that this variant is able to handle motion with aplomb despite the well-known disadvantages of its panel tech. What we dislike about the AOC CQ32G1 lies more in its physical features such as its tilt-only stand. We consider small details like this as a big fault for a product of this caliber, especially for a brand that leads in value and satisfaction.